Is Brigitte a loving wife and mother, or a cold-blooded killer? Nobody knows why she was out so early on the morning she was knocked down in a hit-and-run. Or why a man was found beaten to death in her apartment that same day. What was Brigitte doing before she was run over? Who killed the man in her apartment? And why is she haunted by the face of Kurt Cobain, who reminds her of someone she’d rather forget…? As Brigitte’s world begins collapsing in on her, she is forced to confront the truth about that night – even if it means losing her husband, her kids, and maybe even herself. This is an elegantly written Australian novel that flows well but left me with mixed feelings. Chandler's debut is squarely aimed at the burgeoning 'psychological thriller/domestic noir' trend in crime and mystery writing of recent years. Brigitte is the wife of a cop and mother of twins, a seemingly happy life, but is she really living a life of deception or delusion? Fourteen years before she barely survived a hit-and-run, on the same day that a man who she had a contentious relationship was found murdered in her apartment. She says she has no recollection of events - but do we believe her? The murder remains unsolved, a cold case... but then it comes to life again years later. As the pressure of the new investigation ramps up, fissures open in Brigitte's carefully constructed life. The veneer peels away, as we discover more of who she really is, and was. 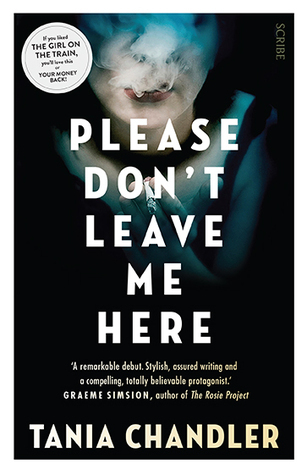 PLEASE DON'T LEAVE ME HERE is an assured debut that contains plenty to admire. It's absorbing, at times compelling, but I struggled a little with it, largely down (I think) to Brigitte. She's severely unlikable in the first part of the novel, and not in a Tony Soprano/Dexter kind of way that can be engaging even if they do evil things. Instead, Brigitte's all a bit self-absorbed and woe-is-me, almost narcissistic while being quite passive. Having said that, she is very human and believable, and I still felt compelled to find out what was going on in her life, now and then. So while PLEASE DON'T LEAVE ME HERE flowed well, and was elegantly written, from the beginning I felt at a distance from the main character, rather than alongside her. This pulled me out of the story and made me aware I was reading a story, rather than being 'in it', so to speak. The second half of the book was better, and gives us more insight into how and why Brigitte became how she was (perhaps inter-cutting the time periods rather than having them in massive sections one after the other may have mitigated some of the issues I had with the first part). It all builds up to an abrupt end which had a touch of 'author hand' rather than feeling organic - though my opinion may have been coloured by the fact that I still wasn't fully alongside the character. An interesting debut that show plenty of promise and lots of writing talent. I can see why others have really liked PLEASE DON'T LEAVE ME HERE, but for me personally there were just a few flaws that affected my enjoyment or engagement, and overall put it in the 'good' rather than 'great' basket.